This is the tarot deck I've been using for the past month. 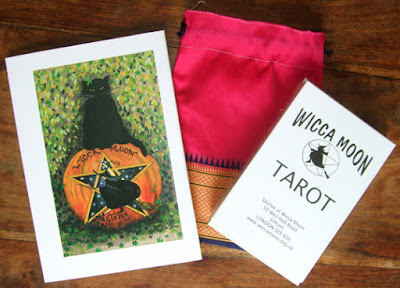 It is the Wicca Moon Tarot and I bought a copy when I visited the lovely pagan shop in Eltham run by Shirlee Moon last month. As a reader of tarot for decades it has always been in my mind to create my own deck. My friends and family inspired me to create the Wicca Moon Tarot. I wanted a magickal deck that revealed the magick and mystery as each card was turned. The imagery and symbols immediately open your own intuitive and psychic self. These cards are so much more than the tarot. You will find inside runes, ogham, seasons, timings, numerology, astrology, elements, energies and deities. The cat that appears throughout the deck is my rescued pet Parsley Pickle. Several things are unusual about this deck. For a start, it depicts real members of the south-east London magical community. The Fool is represented as The Digging Man, a shamanic double of local author Jack Gale. Shirlee herself can be found in the role of the High Priestess. The description for each card explains who they are, so no need to guess. As Shirlee says, each card contains a huge amount of symbolism that goes beyond basic tarot, including runes, ogham and astrology. I've been finding this fascinating and it has increased my knowledge of these other divination systems as I use the deck. 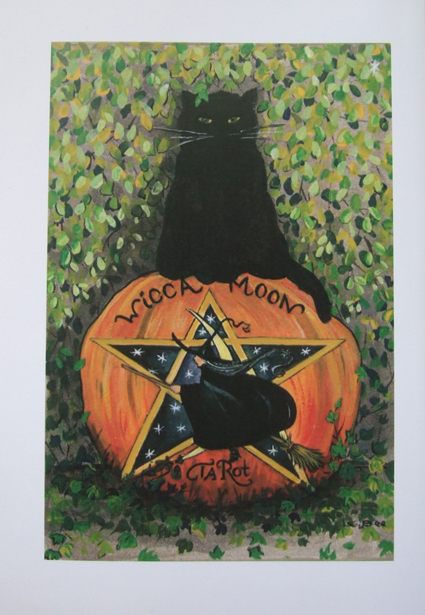 The most intriguing aspect of The Wicca Moon Tarot is that the Kings and Queens are depicted together on single cards. Shirlee explains: "I had a ta-daaaa moment. Originally they were going to be called Lords and Ladies, but I thought this would be too complicated. I put them together as a way to bring their elemental energies into balance..."
I've found this works well in readings. It also ties in with the Wiccan view that magic works best when male and female energies are equally balanced. The artwork is, of course, a vital aspect of any deck. 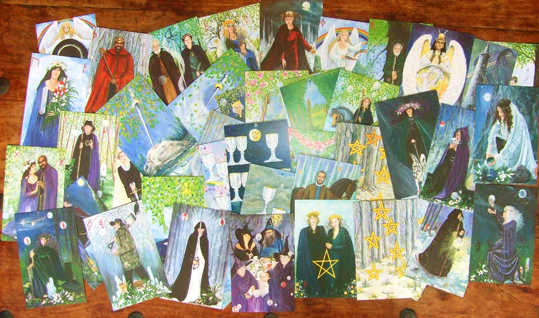 Sandra Hallisbee's pictures are lovely - they really bring Shirlee's vision to life and are full of the depth of meaning that makes tarot reading a joy.